It’s Friday, and we’re talking to our friends about where to meet for dinner on Saturday. They feel like having Italian food. “Good luck with that,” I think. I can count on one hand the reliably-good Italian restaurants in London, and they’re always fully booked on Saturday night. Well, the last laugh’s on me, because our friends worked some magic: Saturday night dinner reservations at Locanda Locatelli at 9:30 pm. I’ve never been to Locanda, but I know it’s expensive, and the food is supposed to be good. So off we go. First impressions are good. The room is large, but the layout allows for lots of inviting nooks and crannies. Our table has a nice, curved banquette. I love banquettes. Generally, the menu offerings sound pedestrian, but most of them are well executed. 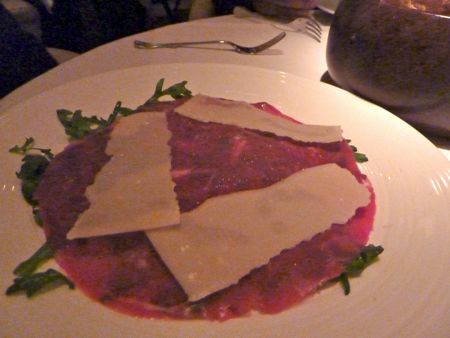 Take, for example, the beef carpaccio and platter of cured meats. There’s a generous serving of both and the ingredients are fresh and delicious. Still, they seem more a reflection of top-notch sourcing than of top-notch cooking. Sadly, the one starter we ordered that was served in an unexpected way (i.e., the pork sausage and risotto) wasn’t especially tasty. I wasn’t expecting the risotto to be a fritter, and while I am normally a lover of all things fried, having a crispy wedge of fried risotto to accompany a massive ball of sausage, all drizzled in a rich sauce, was just unrelentingly heavy. And an artichoke salad with rocket and Parmigiano Reggiano was a total disappointment, especially for £15. There was no interesting blending of flavors or textures. It was as if it were a plate with three separate ingredients on it, which just reinforced my impression that it’s tough to get a decent salad in London. Thanks to ingenious use of lobster stock, the lobster linguine was packed with lobster flavor despite a very stingy portion of lobster meat. I greatly enjoyed this one, though the presentation was a little scary. What’s with the random lobster leg jutting out like that? 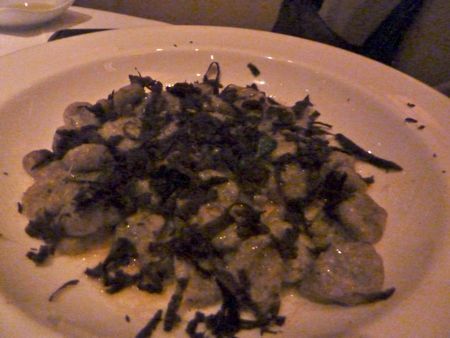 Potato-and-mushroom gnocchi with black truffle was my second-fave pasta course of the evening. 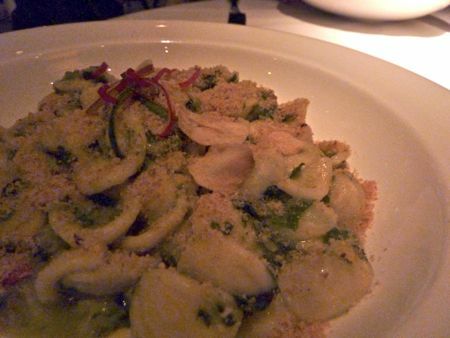 Pillowy-soft gnocchi perfumed with truffle. Perfect. Presentation is what you’d call rustic if you were being generous, though. Orecchiete was the low point of our pastas. It was a giant plate of mush, really. The pasta tasted as if it’d been sitting around a while, and again, the flavors didn’t blend at all. Jon and I make a much better version of this dish at home. The braised lamb neck with buttery polenta ticked all the boxes for a good braise: fork tender, lots of rich fatty bits and a strong sauce for you to mop up. A little more polenta to accompany the enormous portion of meat would’ve been ideal. Contorni were a very mixed bag. The fried artichoke (£6) was masterful, with each artichoke leaf perfectly battered and crisped, but the rest of the contorni were skippable. Fried potatoes (£4.50) were just crispy cubes of potatoes – dressed up chips, really. Regular ol’ broccoli and chili was £4.75 and lacking both kick and flavor. Sauteed spinach (£4.75) was satisfying, but it’s garlic and spinach, yes? Worst menu moment was the tiramisu. A total crime. Stale ladyfingers doused in a runny mascarpone and drowned in amoretto. Despite sharing one portion among four people, we didn’t come close to finishing it, and I was mildly disappointed none of our servers bothered to ask why a little martini glass of tiramisu went only half-eaten. With extras like a £77 bottle of a very tasty Sicilian red wine and a couple glasses of digestifs, our total for four came to £300 (£75 a person). It was a fun evening out with friends, but given the generally-pedestrian and unven food, I wouldn’t recommend a visit. And I definitely can’t help comparing our dinner at Locanda with my repeat dinner at Trullo just this past Monday night. 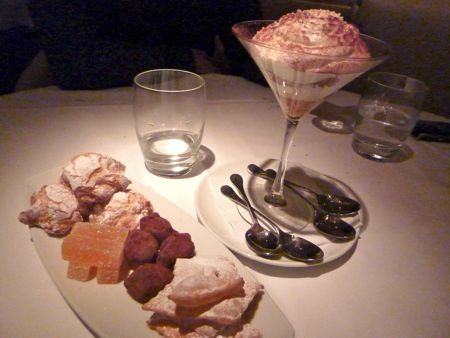 At Trullo, I paid £26 a person for a starter, an excellent pasta, a shared main of braised lamb neck, and a shared dessert (i.e., the tastiest caramel pannacotta, ever). Service at Trullo was friendly and helpful, so the only thing that was superior about Locanda was its comfortable seating and dining room, and that’s not worth the price premium, I reckon. Interesting stuff. I had Locanda Locatelli on my shortlist after two disappointing meals at Theo Randall – I didn’t want to write off posh Italian restaurants in London without trying the big boys. But this sounds incredibly pedestrian, and as you rightly point out, places like Trullo, Zucca and Tinello just do this kind of food, better, and much cheaper. You wonder how much longer these flashy places can survive turning out mediocre food at stratospheric prices in a town that can boast better Italian food for less elsewhere. I had a similar dish as your orecchiete at Tinello, and the end result was very similar, a bowl of green mush with no discerning flavour. 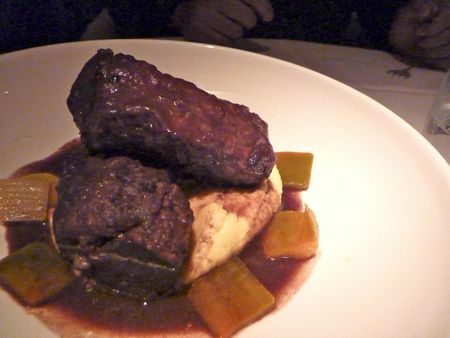 Thankfully, the rest of the food was pretty decent, and at £35 a head, is much more reasonably priced. 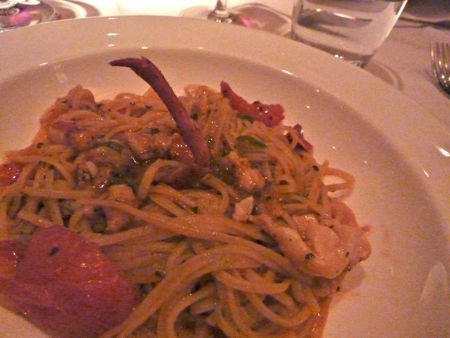 @Chris – I’ve had good meals at Murano and have a revisit booked in the next couple of weeks, but otherwise, I can’t say visits to high-end Italian places have worked out that well for me, generally. This is true even in New York (e.g., Il Mulino in its heydey), which has an enormous number of Italian restaurants competing against each other. @tehbus – I wasn’t super thrilled with our experience at Tinello, either, but I agree that at that price point (£11 per pasta main), the disappointment hurts less! I thought LL was a bit underwhelming when I went last autumn (I do go to some posh places but they’re the ones I don’t blog about!). The bread was excellent, as was the trio of choccie desserts, but what came inbetween was a bit meh! And one more thing, having artfully made the restaurant separate from the hotel, to a certain extent anyway, you’d have thought that they could manage separate toilets? But no, you have to use the hotel toilets. Don’t ask me why, but having to use hotel toilets is a bit of a mood killer when eating out. I have always wanted to try Locanda Locatelli but have to say this review has put me off. Have you been to River Cafe? Although simple food I have to say the execution of everything I ate there was fantastic – so maybe high end Italian can work. cook with ingredients such as foie gras. That’s what you need for this price point. What wine did you drink? Am so glad someone else has experienced this dreadful tiramisu! I couldn’t believe how bad it was, especially given (a) the tiramisu recipe in Locatelli’s recipe book looks so incredible and (b) well… this is meant to be a starred Italian restaurant?! I haven’t eaten at Locanda for about 4 years now, but it seems things have skipped massively. Which is a shame as I’ve had many a god night there. But yeah the prices were always very high, but when you get great food you don’t mind it too much. I can’t believe that noone asked about the left pudding. Shameful. 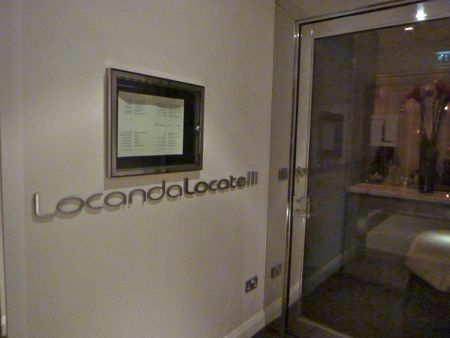 After a truly dire service experience at Locanda a couple of years ago I will never go back…. Get yourself to Zucca…so well priced and a lovely dining experience (Granted though, the locanda dining room is a nice one). For the Locanda prices I’d far rather eat at River Cafe. Until I read this (and the comments) I have been surprised at how well it’s rated…but it seems my underwhelming experience was not so unusual afterall! @Mr. Noodles – good point about the loos being part of the hotel. Agree that it really alters the mood that the restaurant works hard to create, but def not as bad as paying a lot of money for uneven food. @Rahul – I don’t recall the name of the wine, but I’m pretty sure the grape was petit verdot. And I agree that our dishes were “peasant” food, though I also think a meal can be haute without foie gras. @embamford – Not a bad guess re: why nobody wondered about four people unable to finish a single dessert. Still, it has probably more to do with polite, attentive-in-a-going-through-the-motions-way, but ultimately indifferent/perfunctory service. 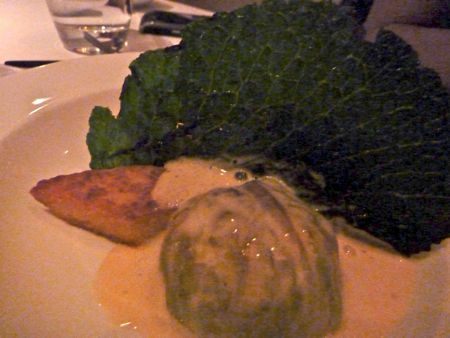 @Mzungu – I can’t claim that I was dying to try Locanda Locatelli even four years ago, though nice to know it was once very good. @Clarice – if I could successfully get a booking at Zucca (I have tried multiple times), I would. But I def agree with your more general point that you can get very good-quality pasta (or Italian food, generally) for less money at other restaurants in London.